As a dietitian, people often ask me what they should eat. Which foods are the healthiest? Should they eat sugar or artificial sweeteners? Is fat bad for you? I get these kinds of questions all of the time. I do not diet. Ever. Instead, I focus on eating an overall balanced, nutritious diet packed with superfoods. My definition of superfoods are foods that are loaded with nutrition. 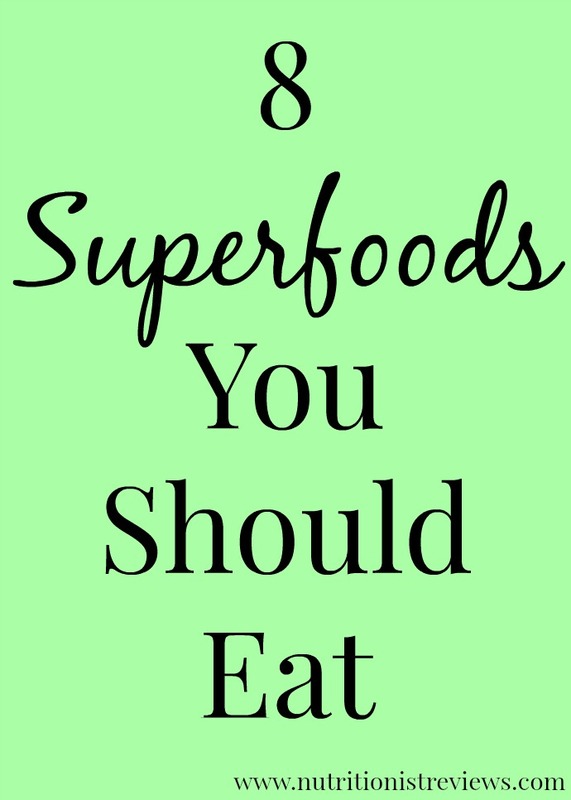 They do not have magical powers or anything like that but are foods that I eat as often as possible because I know that they are great for me (and taste great too!). 1. Chia seeds- Chia seeds are loaded with protein, fiber and omega-3 fatty acids. I eat them almost daily in my oatmeal or in my Greek yogurt. 2. Kale- Oh kale! You and I had a love-hate relationship in the past but now, I really love you! Kale is packed with tons of vitamins including vitamins K, A and C. You can eat it raw, sauteed, baked, in a smoothie, etc. The options are endless. 3. Almonds- Almonds are a good source of healthy fats, vitamins, protein and fiber. They make a great snack because they fill you up while being very nutritious. My favorite way to eat almonds is in almond butter. 4. Black beans- My daughter Adalyn is thrilled that this is a superfood because since she was 5 months old, she has been a huge fan of black beans. For good reason too! Black beans are rich in fiber and protein making them a great protein choice for a meal. 5. Wheatberries- Wheatberries are a grain that many people are not familiar with but are one of my favorites. They are chewy little whole-grains that are rich in protein, fiber and iron. I love them in a soup or in a salad. They take about an hour to cook so I recommend cooking up a big bag at once and freezing in sandwich bags to save time. 6. Blueberries- Blueberries are rich in manganese and vitamin C which is an antioxidant. Eat them in my blueberry banana granola bars. 7. Spinach- In my opinion, spinach is one of the most versatile foods. You can eat it in a sweet smoothie, in a breakfast omelette, cooked into a soup, raw in a salad and much more. Spinach is rich in vitamins A, K, manganese, folate and magnesium. Aim for at least one serving of leafy greens each day. 8. Broccoli- Broccoli is rich in vitamins K, C, folate and chromium. It is awesome raw or sauteed in a stir-fry. I love roasted broccoli with garlic, a little soy sauce and olive oil. Want to know where you can get a bunch of these nutrients at once? The new elevAte salads! They are packed with many of these superfoods and are so fresh. I love them for a healthy lunch on-the-go. Lots of prepackaged salads are not very fresh, loaded with meat and cheeses and use iceberg lettuce which does not have many nutrients. I got to try all of these salad varieties and each of them were awesome. You can find them at Walmart. The Power Grains salad was one of my favorites with spring mix, carrots, red cabbage, raisins, almonds, wheatberries, quinoa and topped with an orange vinaigrette. So good! elevAte is giving away lots of fitness gear and 4 grand prizes including gym memberships, an Apple watch and gift cards. You can enter here. Disclosure: This post is sponsored by elevAte. All opinions are my own. Yay! Yes, try wheatberries. They are one of my favorites. Very chewy but I like that. Throwing them in some soup is my favorite way to have them. Where can you purchase wheatberries? I have never seen them in a grocery store. I've gotten mine at Meijer- I buy the Bob's Red Mill brand. I'm sure you could get them on Amazon too.